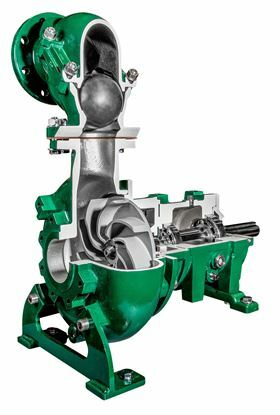 Franklin Electric's Pioneer Pump Vortex Series pumps can deal with challenging solids using vortex technology. Franklin Electric has introduced its Pioneer Pump Vortex Series pumps designed for waste handling, sludges, industrial effluent, chemical processing, and other applications where fluid conditioning, macerating, or mix-prevention are not required. The pumps can pass through the most challenging solids using a recessed impeller that avoids direct contact. This is accomplished using vortex technology, which saves time and money in the most difficult applications by eliminating internal wetted parts, like wear plates and chopper blades, that would otherwise have to be monitored, adjusted, and replaced. The company says that the pumps have a heavy-duty cast iron casing construction, an oversized stainless-steel shaft, and a leak-proof run dry mechanical seal, all of which ensure high levels of reliability. There is a wide range of electric and diesel packaging options for both fixed and portable installations and pumps can also be fitted with the Pioneer Prime vac-assist system for suction lift applications. The Vortex Series pumps are available in 4x4, 6x6, and 8x8 sizes and cover flow rates up to 3,600 gpm and heads up to 150 feet. Milan Supply Co operates six locations in the State of Michigan and has approximately US$22 million of consolidated annual sales.